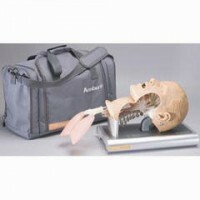 The updated Ambu Intubation Trainer is perfect for teaching intubation techniques with a variety of airway management tools. Design features a cut-away side, which allows for a clear view of the pharynx and trachea. The accurate, detailed anatomy also enhances training. Click the button below to add the AMBU Intubation Trainer to your wish list.